Banbury II moved up to second place in division one of the Cherwell League as they saw off Horspath II by four wickets, leaving the hosts rooted to the foot of the table in the process. Banbury put the home side in to bat first and they were bowled out for 224, Richard Simpson taking 3-24 and George Tait 3-45. For Horspath, Jamie Stead top scored with a fluent 50. Led by Ollie Morgan 52 and Tait 43, Banbury reached 225-6 to wrap up victory in the 46th over. Banbury are now back to just 11 points behind leaders Long Marston. Division two leaders Bledlow Village were too strong for Great & Little Tew II as they raced to a seven wicket win. James Hawkes 4-28 and Matthew Pearce 3-25 blew Tew away for just 89 runs and then Will Woodward struck 46no to lead Bledlow home at 90-3 in the 14th over. Resurgent Cropredy beat basement boys Oxford & Bletchingdon Nondescripts by seven wickets. The home side set 203 all out, Aadam Samiullah hitting 74 and Joe Butler 71. Matt McInerney top scored with 83 in Cropredy’s reply, allowing them to reach 210-3 with more than 13 overs remaining. A six-wicket haul from Tom Goffe was in vain for Sandford St Martin, who fell to a 21 run defeat against Leighton Buzzard Town. Despite Goffe’s 6-38, Buzzard reached 242 all out, Antony Francis hitting 88 and Lee Selfe 72. Steve Dobson 42 and Goffe 30 starred in Sandford’s reply but they were all out for 221. Minster Lovell were shot out for a paltry 81 as they crashed to their first defeat, a ten-run loss at Brackley in a low scoring division four fixture. Minster had dismissed their hosts for just 91 as Leigh Smith took 3-17 and Eddie Dunn 3-24. Minster struggled to adapt to the conditions and some excellent bowling as they slumped to 81 all out in reply, Josh Rowland, Rob Cartwright and Keith Cartwright taking three wickets apiece. 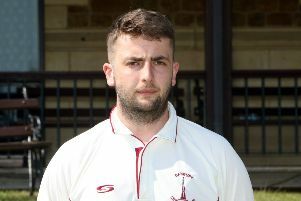 Jake Walters hit a century for Cropredy II but his side could not force victory as visitors Long Marston II batted out for a draw in division five. Walters struck 113 and Pete Cooling 74 in Cropredy’s 236-6. Marston made no attempt at chasing the target, closing up shop to finish on 171-5 in their reply.